I was a Copy Boy at the Associated Press in DC on the Sunday that Pearl Harbor was attacked. I went to HQMC at 8th and I Street in Washington DC and enlisted. The Battle of Wake Island was also a part of my motivation for enlisting. I had friends that were POWs in Japan after their gallant stand at Wake. After Boot Training at Parris Island and a subsequent transfer to Quantico, I attended the AMM School [Aviation Machinist Mate] a six month course at Naval Air Station in Jacksonville, Florida. I then attended the [NAP] Naval Airplane Pilot Enlisted Flight Training at Dallas-Fort Worth in 1943. It was a six month, six days a week course on all the aircraft maintenance and included Morse Code for messages and ship’s blinker light. Also included was training with semaphores (flags). At the time I was there, April 1942, we trained on the old bi-wing aircraft and included wooden spar and fabric work that dated back to the World War I era. Our training aids were real antiques that would be great museum pieces today. The Marine Corps was still equipped and operating much as it had since WWI. By that I mean $21.00 a month, marksmanship pay for Sharpshooter $3.00 a month and Expert $5.00 a month. Flight pay was an additional 50% of base pay. Only rifle was the Springfield 03, we wore canvas leggings, high top dress shoes, starched cotton Khaki and still had a live bugler giving us all the duty calls. The runway at Quantico now where HMX-1 is stationed was under construction; Cherry Point and El Toro had not been constructed yet. Later, I served as a crew chief on the Torpedo Bomber – TBM Avenger. Then in 1950, I served at HMX-1, Marine Helicopter Squadron One, the first Marine Corps helicopter unit and long before it became the Marine One, Presidential squadron. During my career I have served as Line Chief, Assistant Maintenance Chief, Operations Chief, and Logistics Chief in helicopter units throughout the Corps. I also attended the first Marine Sergeants Major class in 1954 at Parris Island. I first landed in New Hebrides Islands, Espiritu Santos for preparation for the Caroline Islands, [mid 1944] Palalua Island, Atoll Ulithi, where we bombed Yap, a bypassed Japanese Island, and patrolled the islands which included Pelilieu. I was in The Battle of Okinawa in 1945 with Marine Torpedo Bombing Squadron 232 (VMTB-232). 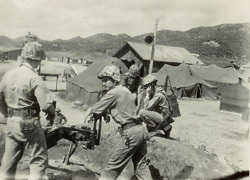 I was in Korea from February 1953 through March 1954. Our mission was evacuation of wounded, observation and artillery spotting, etc. As crew chief I also participated in many of those missions. I also served in Marine Observation Squadron 6 (VMO-6), 1st Marine Brigade, Tongarii Site A-9 in Korea in 1953. In 1963 I delivered UH-34 helicopters to Danang from MAG-16 in Okinawa. Later, I was a civilian contract adviser to Vietnam Air Force Helicopter units from 1964 – 1968 at Danang, Nha Trang, Saigon and Binh Thuy in the Delta. Also several other operations including the “Frequent Winds” evacuation of Saigon in April 1975 and a super secret trip to Oman in late 1979 for the Embassy prisoners in Iran. DID YOU RECEIVE ANY AWARDS FOR VALOR? CAN YOU DESCRIBE HOW THEY WERE EARNED? I only have the “Combat Action Ribbon,” which I am proud to have earned for ground combat defense and an incident when the Japanese landed suicide troops at night from a twin engine bomber at Yomitan during the Battle of Okinawa. Other than that, I have the Presidential Unit Citation and the Navy Unit Citation both of which our units earned. It is sad to say, but unit records during WW II were poor or nonexistent from units. In those days, the unit diary was daily hand scribed and mailed to CMC once each month. Mostly officers were the recipients of the personal awards. While flying H-34 helicopters with the US Air Force Advisory Group in Vietnam 1964-1968, I received the Republic of Vietnam Air Service Medal from the Vietnamese government. I am not sure how they worded it or what it was for since it is written in Vietnamese. I know what I did during World War II, Korea & Vietnam and don’t require medals to confirm it. Many did things that would have equaled the criteria for an award. However it had to be witnessed and written up by someone. MAG-36 Plaque from all my Brother Marines while at Okinawa 14 Years 1973/1987 as Senior 53 Rep. Was on” Frequent Winds ” Operation evacuation of Saigon & Desert One Prep for “Eagle Claw” rescue of U.S. Embassy Personnel in Iran. Alao 14 “Team Spirit Exercises in Korea & exercises in Philippines & Australia. I solved several serious problems which resulted in Airframe changes etc. The Battle of Okinawa! There were a couple hundred thousand dead bodies, ours, Japanese military and thousands of civilians. The smell erased any appetite one may have had for the C-Rations! We watched the Kamikaze attack on our fleet each day. We were bombed and shelled day and night on the coral air strip – Kadena. We were constantly in and out of our fox holes. You could hear the Japanese artillery fire only about three to five miles away to the South. You could count thousand one, thousand two, etc., and tell how far they were from shot to shell impact. At night, when the Japanese bombers came over, our anti-aircraft lights would show them overhead and the heavy flack shrapnel would fall back all around us. One night, Japanese twin engine bombers flew in a few feet off the ocean and landed wheels up with suicide troops that had satchel charges destined for our aircraft. All had sub-machine guns and firing at tents and everything. We were in mass confusion, firing at whatever moved in the dark! The KIA arrived, stacked in 6 X 6 trucks like stove wood! 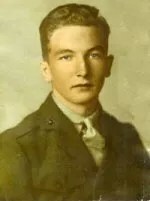 Our troops were buried in a trench about three or four feet deep, and were wrapped in their poncho or shelter half, one dog tag in their mouth, one nailed to the wooden cross at their head and then covered up. I had a constant dread that I might be buried in that manner far from home! I also served in Korea in 1953 with the extreme cold and the extreme wounds of some of our evacuees. I remember the strong smell of dried blood in our helicopters! At times, I think back and remember my crash in the Vietnam jungle near a river when the tail pylon came off my CH-34C in 1966. I was certain that it was the end of my life. How do you separate these to one memory? However, one really good memory was when I soloed in an old biplane as an eighteen year old Corporal and buzzed trains, cattle, barns and the like throughout the Texas landscape! I received fifty percent flight pay and that aircraft all to myself, just me and the wind; smile. What more could an eighteen year old red-blooded American want . . . except possibly a pretty young lady? The young Corporal Drill Instructor that screamed in my face, “Feather Merchant, you will never become a Marine!” I stared back and thought, “I’ll be a better damn marine than you a-hole!” I fired high man on the old Springfield 03 Rifle and got my choice of duty as well as a few dollars added to my twenty one dollar a month pay. He called me out at graduation and said, “When I go into combat, this is the Marine I want with me!” Damn, that felt good! In 1956, while at Naval Air Technical Training Center Memphis, setting up the first helicopter course for the NATTC this episode happened. An old beer drinking friend’s antics created a story that is a classic! Buck Yeager was the oldest Tech Sergeant in the Corp at the time. He was well known for activities that would have got most of us court-martialed. He was tolerated by most because he was also a good Marine. He was in my car pool with several other Marines. One day I was busy in the class room when the Sergeant Major called and asked for Buck to report to the Squadron Office. He had no classes that morning and I knew he was outside the gate at the VFW having a few cool ones. So, I called and informed him that the Sergeant Major wanted him at the Squadron Office. He replied “Tell him I’ll be there at 13:00 hours”. That evening, I could not find Buck when we were ready to go home. So, I went to the Squadron Office to inquire about him. The Sergeant Major told me Buck was in the brig! I asked what had happened. They had seated Buck outside the Commanding Officer’s office awaiting his appointment and detailed a young Sergeant to watch him since he had been drinking. Buck went to sleep and when the Commanding Officer opened the door, the Sergeant shook him. Buck jumped up and floored the Sergeant! The kicker was when I asked what the Commanding Officer wanted with Buck. The Colonel was going to present him his Good Conduct Medal! I still remember the CO Col E. C. Glidden, he was a Marines Marine!! He salvaged Buck and after drying out was allowed to retire. Buck was called back to active duty during Vietnam and was promoted to MSgt. The sad thing was that a few years back I attended the HMX-1 reunion and Buck showed up barely able to walk, dying of cancer. He had arrived by bus to Quantico from New York. We all pitched in and flew him home. Buck went to guard the gates of Heaven about 2 months later. I always treasured those days when Marines were not exactly parade ground perfect, got the job done and were tolerated by some damn good Officers. I was flight adviser and instructor to VNAF H-34 Helicopters from 1964 through 1968, in units at Danang, Nha Trang, Saigon and Binh Thuy in the Delta. I rotated flying, two weeks each unit, for four years. I think I saw every square inch of South Vietnam. Some of it was damn unfriendly. I spent three years with the Malaysian Air Force SH-3D helicopters and off shore operations from 1969 through 1971. Then I worked three years at NAS Alameda with a CH-53 Marine Reserve unit. Then for fourteen years, from 1973 through 1987, I was Senior Helicopter Rep, MAG-36, in Futema, Okinawa.I was in Frequent Winds, “Operation Evacuation”, in Saigon. I also went on a top secret trip to Diego Garcia, on the carrier, USS Nimitz and Oman, on November 27th, 1979. I found out later that it was preparation of the Navy RH-53 helicopters for Desert One which took place later and ended in the crash episode in the desert. I deployed each year, fourteen of them, for “Team Spirit” exercises in Korea. I retired at 1st MAW, Camp Butler in March 1987. Back in California, I received a call from a Dallas, Texas company that wanted me to take over an Inspect & Repair operation at Helwan, Egypt on Wessex SH-3 helicopters. I worked that project from 1991 until 1993, both in Egypt and Dallas, Texas until a law suit was presented against the company. I was then sent to Geneva, Switzerland for the International Tribunal. I retired again and now just go to military reunions and get older day by day! ARE YOU A MEMBER OF ANY MILITARY ASSOCIATION(S)? IF SO, WHICH ASSOCIATIONS AND WHAT SPECIFIC BENEFITS DO YOU DERIVE FROM YOUR MEMBERSHIP(S). I’m a member of POP A SMOKE, the USMC Combat Helicopter Association. I am a member of Marine TWS. It was my entire life’s work and a very satisfactory career. I would do it all again, happily. I approached each day looking to see “What’s next”, preparing to go and I always traveled light! Here’s a word to those serving today. It is a great career. Certainly the pay and benefits are now far superior to years back. I started at $21.00 a month and after 21 years my base pay as a MSgt. E-7 was $380.00 a month. Three months before I retired, the new E-8/E-9 ranks were incorporated and I was suddenly designated a “Gunnery Sergeant” E-7. Stay at least for 20 years since it is a retirement not available on the outside at such a young age. In the combat areas it would pay to study & understand your enemies. HOW HAS TOGETHERWESERVED HELPED YOU TO MAINTAIN A BOND WITH THE SERVICE AND THOSE YOU SERVED WITH? It is a means of staying in touch with all of the brothers with which I served and remembering those times both good and bad. It is also a reason to get up and do something each morning! ← Join Together We Served Today!